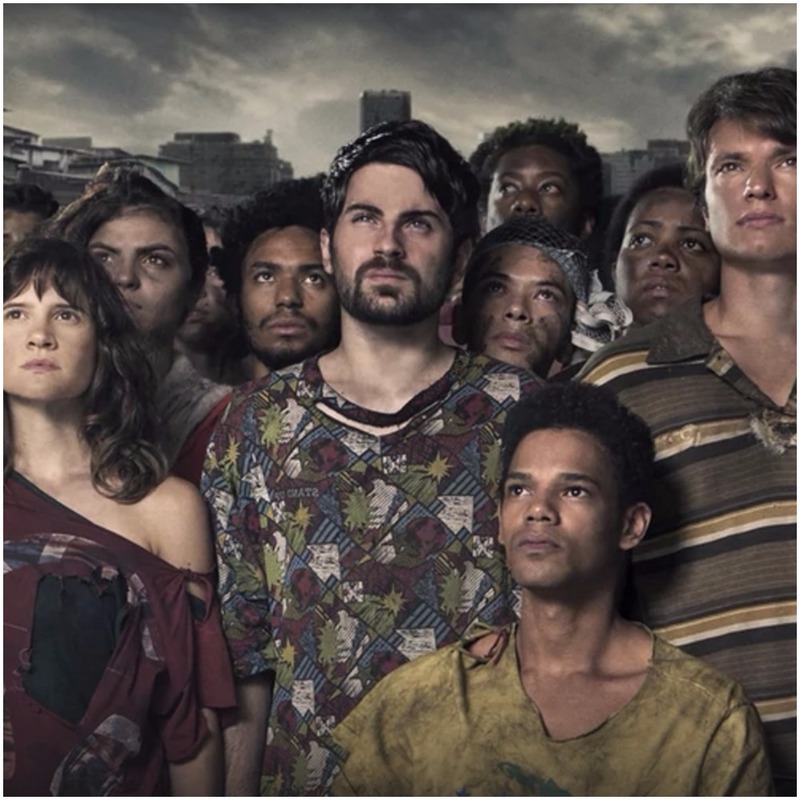 3% is the first Netflix original out of Brazil and the differences are immediately visible. Unlike many shows created in North America, 3% has many people of colour in the cast. Even if I didn't find the premise interesting right away, I think I would be compelled to give this more time than I would another show because it's refreshing to see so many hues of people on my television screen. The premise of 3% is a futuristic dystopian world in which the majority of population lives in extreme privation while a privileged 3% live off shore in a utopian world. Each year, at the age of 20, in land citizens go through a form of rigorous testing which will decide if they will have a life filled with privation, or one of luxury and comfort. As you might imagine, the test causes great anxiety for those participating. The testing and the lifestyle of the 3% is something that many in the 97 resent, so much so that they have created a resistance. The candidates are notified via some device that has been implanted in their ear. It's a long march to the testing site and when they arrive, they are told to change their clothing. Candidates get weeded out almost instantly, as some fail the initial interviews. The questions asked are designed to mess with the candidates emotionally and place them under stress. Watching the entire interview process is Ezequiel, who is under much more stress regarding his selections than previous years. The offshore, which is supposed to be a Utopia, has experienced its first murder in over 100 years. The murderer is a candidate who passed Ezequiel's rigorous testing the year before. Ezequiel is thrown for a loop when he is informed by counsellor Nair that Aline has been sent to observe the entire process this year and that many on the island blame Ezequiel for the murder. It's clear early on that Ezequiel is an arrogant tyrant who only cares about his testing procedures. The rejects who fall below the 3% maker are clearly people he sees as subhuman. Ezequiel doesn't even respect his own staff and actually suffocates a woman in a sink full of water when she displays sadness that a reject jumped to his death after she failed to pass him. Ezequiel felt that the only way to teach the lesson that what they do is a matter of life and death was to simulate drowning on a subordinate. It's only the first episode and I'm ready to see Ezequiel get his. Although they all come from the same economic background, the candidates are very different personalities. There's Rafael, who falsified his registration and then cheated on a test to be able to stay in the running, in the process causing someone else to be eliminated. Rafael is smart enough to know that cheating caused great animosity among his fellow candidates and so he orchestrates a situation in which several candidates become violent in order to gain sympathy. Rafael is absolutely conniving and when Joanna notices this, she enlists him as a team mate. For her part, Joanna is extremely bright and she exceeds on the first test. I love that she is laid back, bright and clearly full of some epic snark. Marco is perhaps the most confidant candidate of them all because his family has a history of passing the test. Fernando is the disabled candidate and he refuses any and all help because he believes that looking like he needs help will eliminate him. Fernando however is willing to do a good turn when one is done for him. At the end of one test, when it looked like Michele was going to be eliminated for failing to assemble enough blocks, Fernando quickly creates one large block allowing Michele to pass. It's clear that we're meant to focus on Michele as far as tributes go. Michele is a member of the Causa resistance and is called an infiltrator. Michele wants revenge for the death of brother the year before in the trials and she blames Ezequiel. Before entering the testing, Michele was coached on the right answers to say in order to pass the test. Unfortunately, as luck would have it, the murdering resistance member is captured and under torture reveals what street this year's infiltrator lives on. There are two candidates who live on the street in question: Michele and Bruna. Both candidates are called in for questioning and informed that if one of them doesn't confess to being the infiltrator, they both will be killed. The moment that Cassia, the interrogator leaves, Michele puts on a first class performance, claiming that she's not part of the resistance and that this must be some kind of mistake. Michele easily fools the clearly innocent Bruna. Michele devises a plan for both of them to attack Cassia when she enters the room. Sure enough, when Cassia returns, Michele slaps Bruna's leg to indicate that they should attack but refrains from acting herself. Bruna is immediately shot to death, thus eliminating suspicion of Michele for now. Ezequiel quickly comes rushing into the room, giving Michele the chance to meet the man she deems responsible for her brother's death. Michele remembers that in her training to infiltrate the test, she was warned that if she were to ever meet Ezequiel that she should run the other way. Ezequiel points a gun at Michele while he checks on the well being of Cassia. It's telling that Ezequiel apologises to Michele for being forced to witness Bruna's attack and death given how unsympathetic Ezequiel was to one of his team members who had the temerity to be sad for a candidate who committed suicide; empathy is not one of his character traits. What is particularly cold about Michele's actions is that she knew Bruna and Bruna's family. Their reaction to being informed that one of them is a perpetrator evidences that their relationship could even be classified as a friendship. What kind of person does this make Michele? It's clear that the candidates are going to have to sacrifice a lot of things and a lot of people to be selected but the ease in which Michele threw Bruna under the bus tells me that at best, Michele is going to be an anti-hero. Going into this I didn't realise that this show is produced in Brazil and so I was surprised by the dubbing. It's a measure of how much the story interests me that I am willing to continue because the voice acting in 3% is abombinal. 3% also doesn't have in it's favour that right now it really feels like a poor man's Hunger Games. I keep waiting for an Effie Trinket like character to appear on the screen and announce to a waiting crowd,"May the odds be ever in your favour". As much as this is a dystopian, there's also a sense of psychological thriller about it that has me in engaged. It will be interesting to see just how love the candidates are willing to sink to achieve their objectives.